So...I was supposed to be super-mom and take my kids hiking with a group a friends today, but it has been raining non-stop for the last couple of days. No way am I taking two minis under the age of 4 hiking in the mud. I'm sure they would have had a blast jumping in mud puddles, but that would mean 4 hours of cleaning clothes, shoes, stroller, dog, etc. for me. No thank you. Instead, I made this delicious summer cocktail for you. Normally I would say that it is a crime to mess with a good beer, but not when it comes to a shandy. 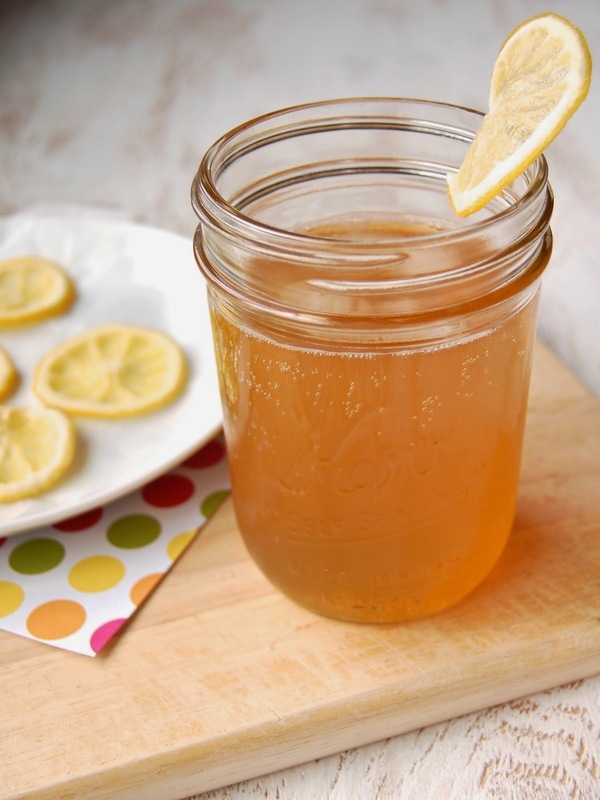 Beer and sparkling lemonade just work together. It is perfectly cool and refreshing, especially on a hot summer day. To add an extra little something, I made candied lemons. They are like homemade Sour Patch Kids. Tell me you wouldn't want some too. For the candied lemons, in a medium skillet, dissolve the sugar in water over medium heat. Add the lemon slices in an even layer. Return to a boil, then reduce the heat and simmer for 15 minutes or until the lemons have softened. Transfer to a wax lined baking sheet. Let cool. Sprinkle with extra sugar, if desired. Refrigerate until ready to use. To prepare the shandy, fill a glass half way with beer. Fill to the top with lemon soda or lemonade. Serve with a candied lemon slice on the edge of the glass.